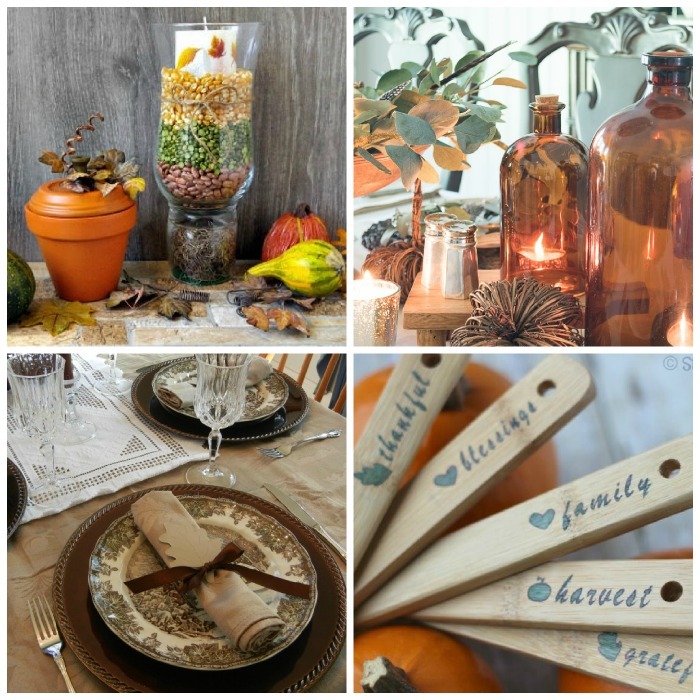 These Thanksgiving Tablescapes and holiday table ideas are so earthy and warm too, with all the colors of fall.Thanksgiving will soon be here and it’s the perfect time to bring out the big ideas for Table decorations. A tablescape is a term used to describe the decoration of the entire table top. The upcoming holiday season is the perfect time to get creative with your table decor. 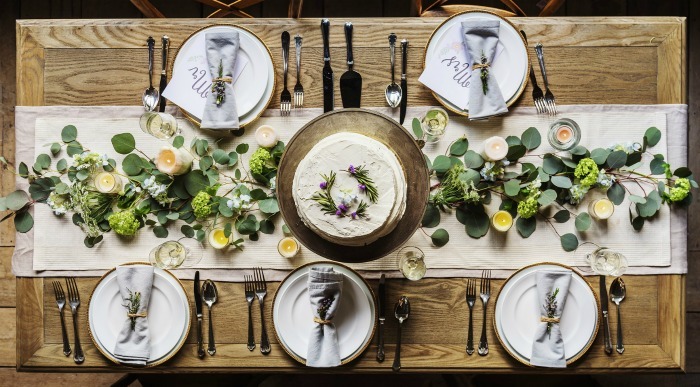 Beautiful Thanksgiving tablescapes include the centerpiece, linens, dishes, flatware, glassware and any other decor that you use to set a theme. Sandra Lee of the Food Network features tablescapes in her cooking show Semi Home made each day. The holidays are the perfect time to decorate in special ways and tablescapes are one way to set the theme and put people in a festive mood. I thought it would be fun to feature some of my favorite tablescape and centerpiece ideas. If you are looking for some inspiration for your Holiday table, Grab a cup of coffee and enjoy these beautiful Thanksgiving table settings. Pumpkins aren’t just for Carving! Pumpkins come in so many wonderful colors and shapes. Cinderella pumpkins make a great base for a wonderful succulent arrangement that can be the star of a tablescape. 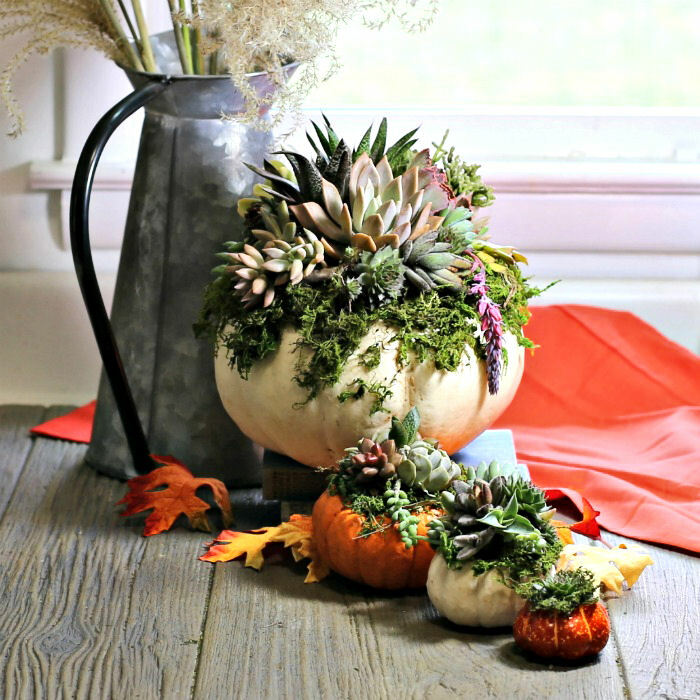 This tutorial shows how to turn your pumpkins into wonderful succulent arrangements. 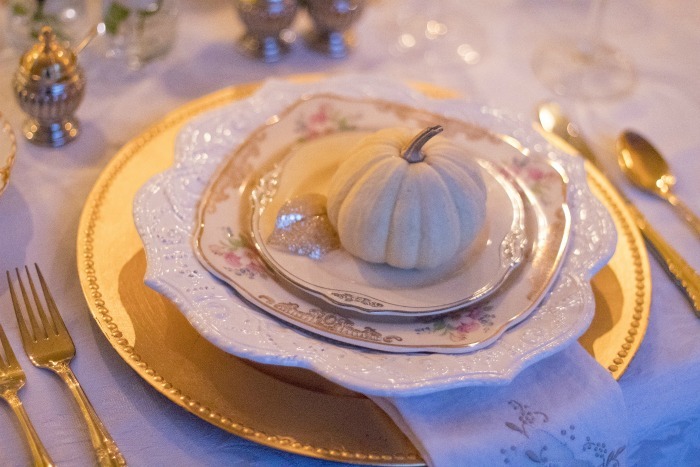 If you like elegant Thanksgiving tablescapes, this is the one for you. Use miniature white pumpkins on each table setting for an instant holiday mood setter that is both simple and inexpensive. Gold plates and silver ware and lots of glitter makes this a magical look. 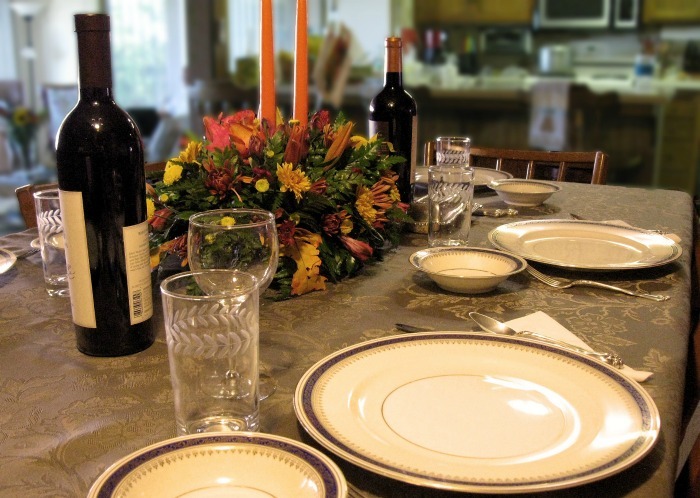 Thanksgiving tablescapes do not need to be elaborate. Sometimes, just the colors can set the mood. This lovely Thanksgiving table setting features a combination of brown and cream ribbon, napkins and plates to set a warm and inviting mood. The autumn leaves under the brown ribbon on the napkins add a simple festive touch. What a perfect way to show your Thanksgiving guest what will be on the menu! This easy to make Thanksgiving dinner menu plaque is put together in just a short time with supplies from your garden and the Dollar store. This table scape is perfect you want a rustic style for the look to your table. It uses natural garden items and seeds and beans such as acorns, split peas, berries and small pumpkins. See more of this idea at Celebrations at Home Blog. I love the rustic look of this easy Hurricane Lamp Fall Centerpiece. Don’t worry if you don’t have a hurricane lamp. This one is made from a thrift store glass vase and tumbler for less than $2! The dried beans, popcorn and green split peas give it a warm homey look. 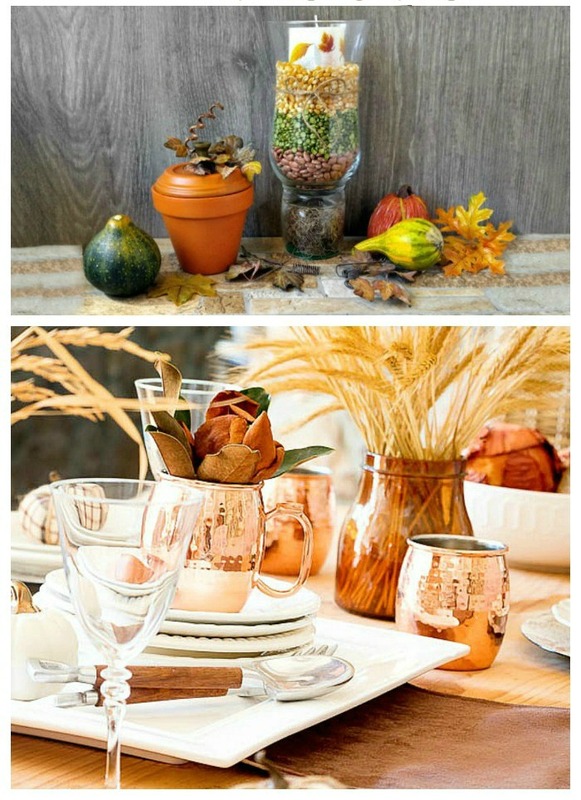 Add the clay pot pumpkin and some gourds and you have a lovely coordinated table that is perfect for Thanksgiving. 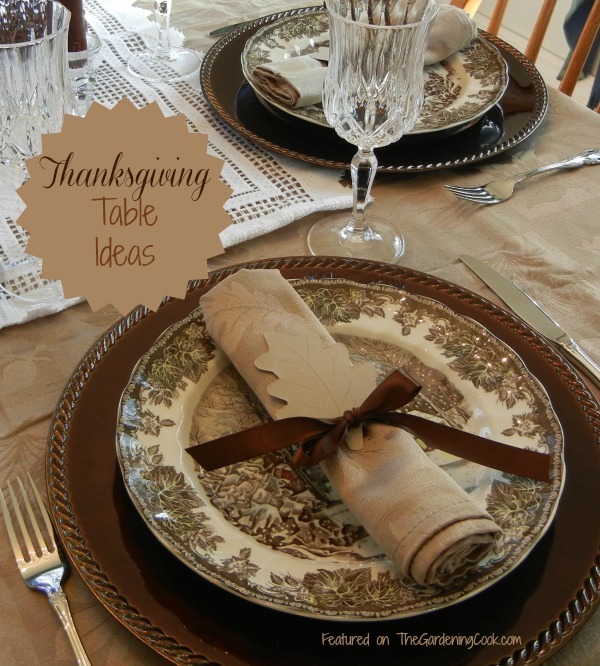 If simple Thanksgiving Tablescapes are more your cup of tea, try this idea. A table setting can be both inexpensive and simple in design and yet still set a beautiful mood. 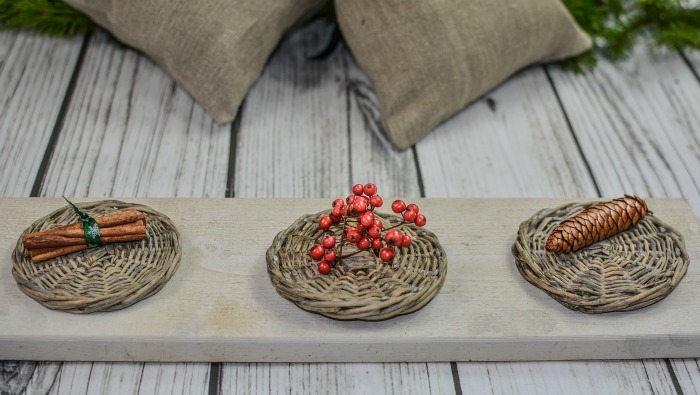 This design makes use of woven round trivets on a plain board each topped with a simple seasonal natural items, such as cinnamon, pine cones and berries. Make your board longer to suit your table size and add more trivets. Other natural items are leaves, acorns and sprigs of pine boughs or rosemary. If you are pressed for time, a simple floral centerpiece arranged on floral foam with a couple of autumn colored candles will set a mood nicely. Tie in the colors to your dinner ware and you are set. 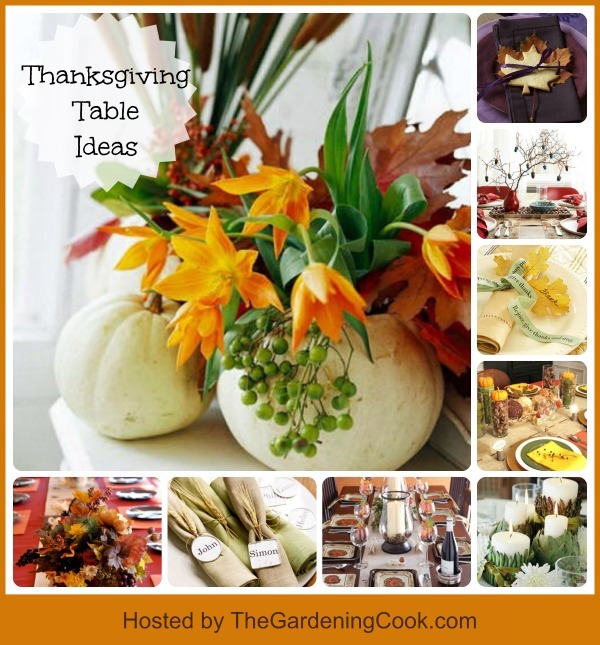 This is a great idea for those that like easy Thanksgiving table decorations. A walk around the garden outside gives us almost everything we need to make an effective and inexpensive table centerpiece which will add to any Thanksgiving tablescape. Silk leaves also work well. 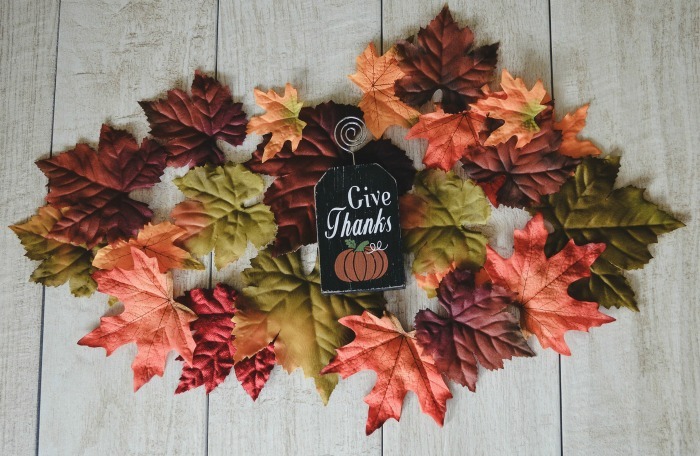 Arrange the leaves in a pretty pattern in the center of the table and add an inexpensive Dollar Store “Give Thanks” sign in the center and you are ready in just minutes. Gather up some pine cones from your yard and trim the bottom so that they sit upright. 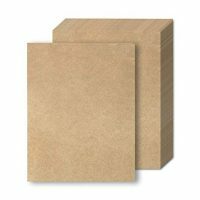 Attach individual names on pieces of kraft paper near all the place settings for a rustic addition to your Thanksgiving Tablescape. Place a light colored table runner and line it with eucalyptus leaves and hibiscus flowers. 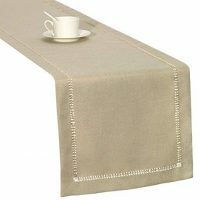 Tie light colored napkins with plain jute and add a sprig of rosemary to each plate for a lovely subtle and natural look. Thanksgiving is a time to be thankful. This place setting does that just beautifully and incorporates some fall leaves too. Namemaker.com has personalized ribbons that you can use to wrap your napkins. 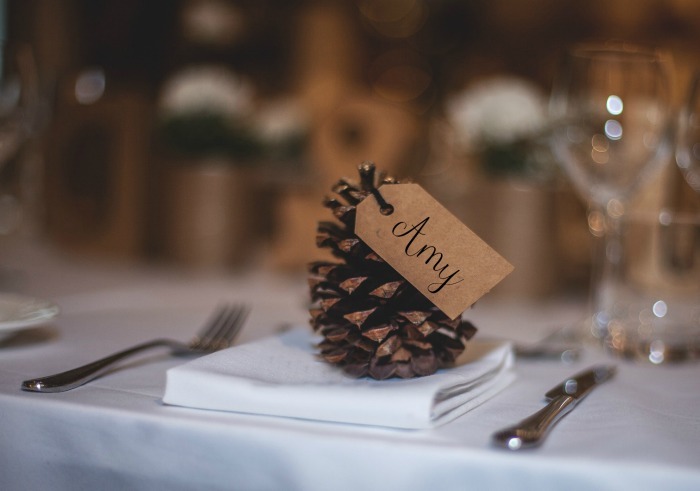 Then, just use a permanent marker to write your guests names on dried or fresh autumn leaves as place cards. Idea shared from BHG. This simple table scape makes use of store bought Thanksgiving napkins with a simple table runner. Add some glass hurricane lamps with pillar candles that have acorns at the base. Then tie it all together with some acorns in the wine glass and simple leaf accents. Napkins and plates are available from Napkin.com. This lovely centerpiece features a long silver serving tray filled with acorns. This base pairs beautifully with a simple vase filled with branches that have been decorated painted acorns. Idea shared from BHG. The color palette of this setting is what make it lovely. The purple is just perfect with the colors of fall. To make this just trace your leaf with heavy card stock and use it as a shape for your sugar cookie dough. 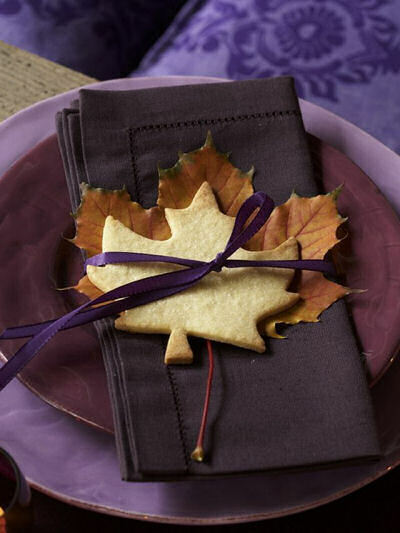 Place the cookie on the leaf and then tie it all up with your ribbon and napkin. Idea shared from Doberman’s by the Sea. 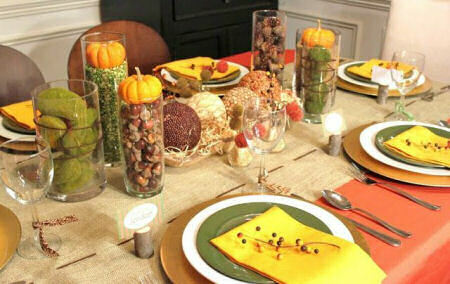 Modern Thanksgiving Tablescapes make use of simple themes, tasteful colors and not a lot of extra fluff. 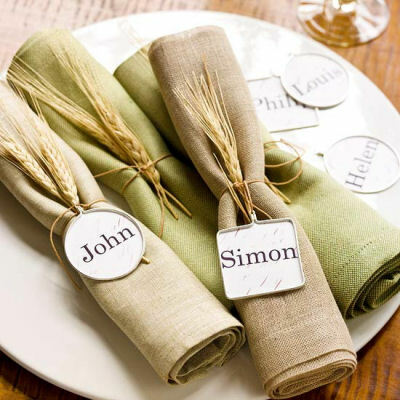 This DIY idea combines napkin rings and place cards in one. It turns everyday cloth napkins in to something special. Just place a shaft of wheat in the center of a rolled napkin and tie it with a piece of jute. Attach name cards made by printing guests’ names on decorative paper and then cutting them to fit on metal pendant frames. Glue the paper tags to the back of the frames and attach with another piece of jute. (can get the pendant frames at any craft supply store .) Idea shared from BHG. These white faux pumpkins can be hollowed out and used as vases. Add some cat’s tails for height and fill in the lower part with berries, fall leaves and autumn colored flowers. Image shared from Better Homes and Gardens. 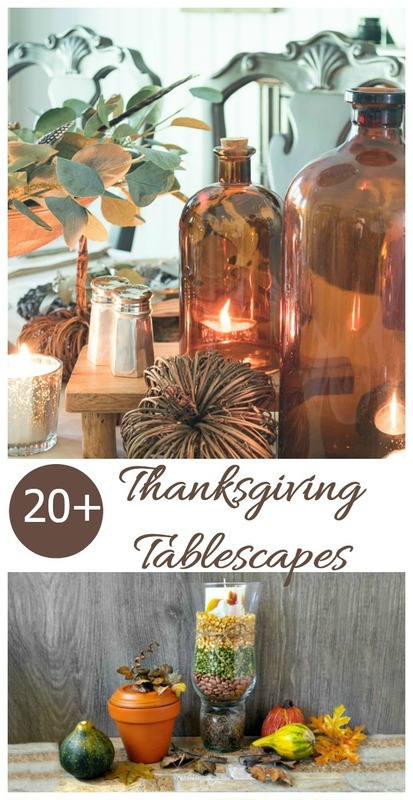 These Thanksgiving Tablescape ideas can be put together in minutes but will add a lovely autumn look to your holiday table. Still looking for more ideas for your Thanksgiving table? Try one of these pretty ideas. 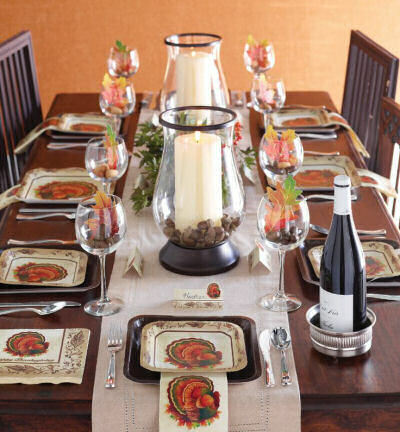 What do you use for Thanksgiving tablescapes for your holiday table? Would you like a reminder of this post for some inspiration for your Thanksgiving Table? Just pin this image to one of your home decor boards on Pinterest. Admin note: This post first appeared in September of 2013. I have updated the post to add new tablescape ideas, a printable card for ideas for your table and a video for you to enjoy. Print out this card to take with you when you are shopping for some ideas for inspiration for your Thanksgiving tablescape. It's easy to make tablescapes that will wow your holiday guests. Use some items from the list of supplies as well as these suggestions for your project. Gather autumn leaves. They can be used to layer over napkins, or to line wine glasses. 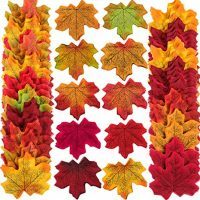 Leaves also add extra fall color around a centerpiece, as well. 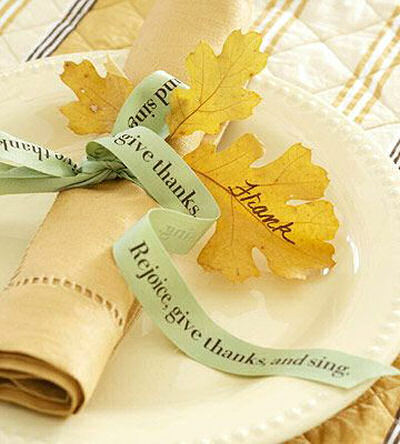 Use personalized Thanksgiving ribbon to tie around napkins for inspirational messages. Add moss and succulents to the top of colored pumpkins for a great looking centerpiece that will wow your guests. 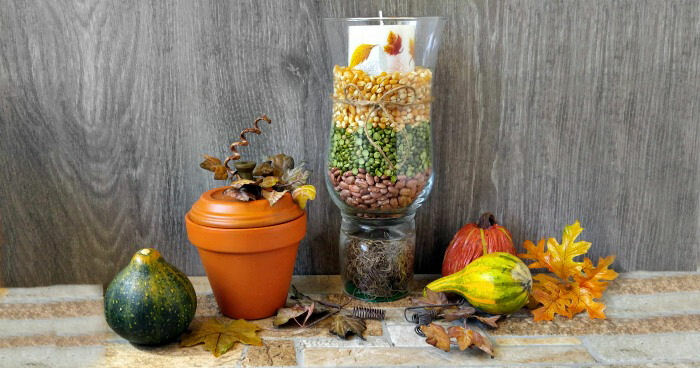 Use popcorn and beans to make a table centerpiece. 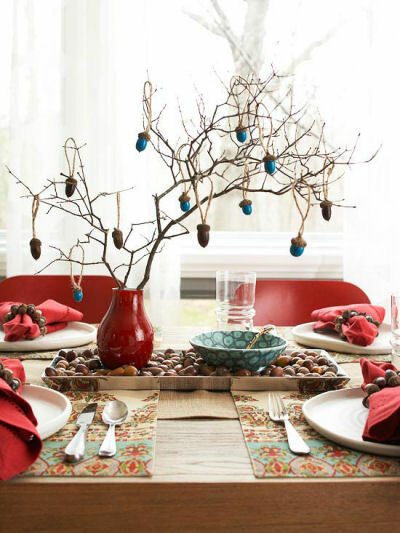 Paint a tree branch and add acorns to make a centerpiece. 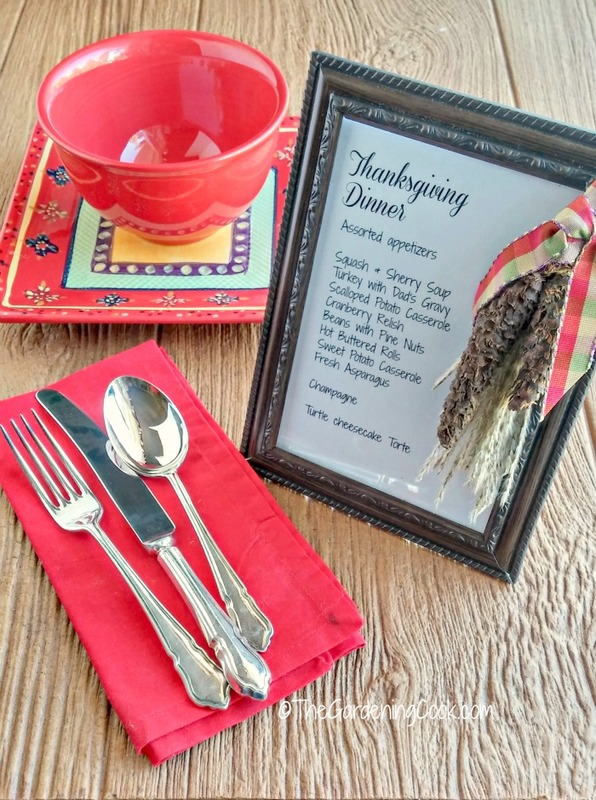 Print out your Thanksgiving menu, frame it and add pine cones to decorate the frame. 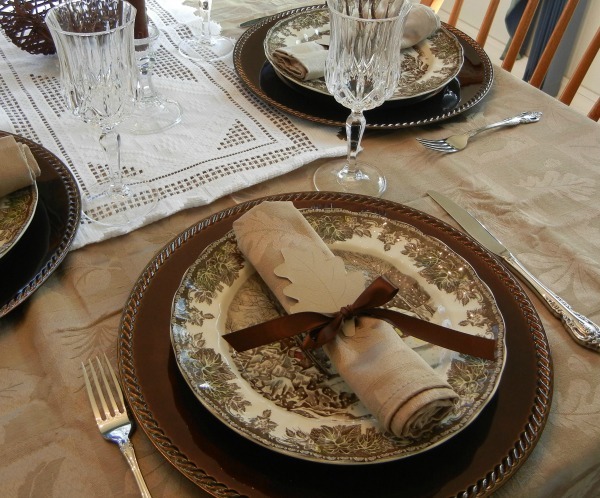 Keep in mind the colors of fall when you choose your linens and table ware. Use free natural elements in your arrangements when possible. 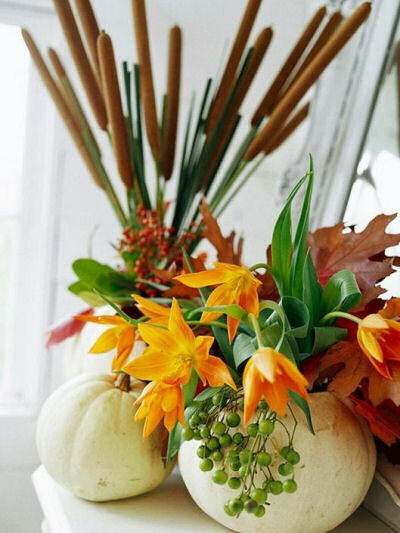 I love the idea of hollowing out the faux pumpkins to use as a vase! That is one of my favorites too Tina. These tablescapes look so gorgeous!! Thanks for sharing them with us!